John Coltrane is both a touchstone and a source of inspiration for the musicians on this recording, but it’s Joe Lovano and Dave Liebman in particular who carry his legacy forward, each in their own way. When they came together in 1998 to play a concert at the Red Sea Festival in Israel under the name Saxophone Summit, their compatibility was immediately apparent. With additional front-line member Michael Brecker (until his passing in January 2007), then Ravi Coltrane, Saxophone Summit has toured extensively and enjoyed annual residencies at NYC’s Birdland. For this recording, fellow Saxophone Summit members Phil Markowitz (piano) and Billy Hart (drums) were joined by double bassist Ron McClure. Whereas Saxophone Summit’s repertoire concentrated mainly on late period Coltrane, augmented by new compositions that were in keeping with Trane’s freewheeling spirit, the group on Compassion tackles compositions from all periods and phases of his career. In theory, as Coltrane continued to develop his sound throughout his life, and his musical horizons expanded considerably from hard bop into modal forms and other aspects of world music, a tribute album of this kind might be expected to be rather bitty, but in practice the music flows naturally from track to track without the slightest hint of awkwardness. The recording dates from 2007, when Liebman was asked by Robert Abel, producer of the BBC radio programme Jazz on 3, to provide a set to mark the 40th anniversary of Coltrane’s passing. As Ravi Coltrane and double bassist Cecil McBee weren’t available, the session couldn’t realistically be billed as Saxophone Summit. Actually, that turned out to be a good thing. Because expectations of a certain kind didn’t have to be met, it allowed the players greater latitude in their choice of material. 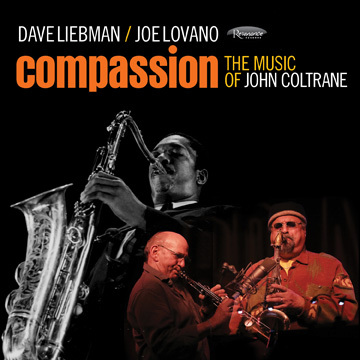 Compassion shows not just what Liebman and Lovano have learned from Coltrane, but how distinctly they’ve developed as players in their own right, especially on tenor saxophone. Lovano’s playing is earthier, more bluesy, whereas Liebman’s lines are leaner and more abstract, sometimes knottily so, as the opening track, Locomotion, demonstrates. In the best hard bop fashion, phrases are traded back and forth between the horns in a collegially competitive manner. After that, direct points of comparison are harder to make because of the changes of instrumentation and the more open form of some of the pieces. That’s particularly true of Om, which begins with a freely improvised duet on wooden recorder and Scottish flute, before Markowitz sweeps a finger over the piano strings in harplike fashion to summon the other players and usher in the theme. Markowitz’s solos here and on Locomotion are hugely inventive, as is his comping throughout the session. It’s a well-balanced programme. The tender lyricism of Central Park West dovetails nicely with Dear Lord, which is serious and spiritual. Reverend King is darker toned, elegiac and pensive. The bluesy strut of Equinox ups the tempo and contains fine solos from Liebman on soprano sax and Lovano on tenor. Billy Hart provides an introduction to Compassion that merges clockwork with funk, interspersed with the kind of hi-hat embellishments beloved of Max Roach. This is the track on which the players stretch out the most and it becomes more of a blowing vehicle, though focus is never lost. It’s also where Lovano unleashes the aulochrome, the instrument designed by Francois Louis comprised of two soprano saxophones bound as one on which he duets with himself. In the half century since Coltrane’s death, hundreds of tribute albums have been issued. While some are very good indeed there are few as good as Compassion.